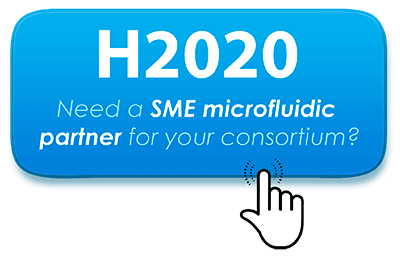 ibidi is a leading supplier for functional cell-based assays and advanced products for cellular microscopy. They provide a large range of μ-Slides and μ-Dishes for live cell imaging. These μ-Slides and μ-Dishes are optimised for inverted microscopes. They are made from high-quality plastics and their autofluorescence, birefringence and refractive index are similar to those of cover glass #1.5. The thickness of ibidi bottom material is 0.17 mm, which is the standard for microscopy. Thanks to this high quality material and thickness, the ibidi μ-Slides and μ-Dishes are compatible with most microscopes objectives. The following review will focus on the μ-Slides dedicated to cell assays under perfusion. Other types of μ-Slides and μ-Dishes can be found on ibidi website. ibidi provides channel slides with different heights, volumes and coating specially suited for flow applications. 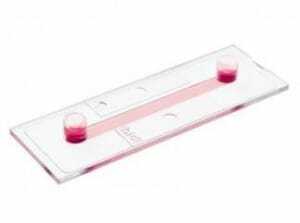 Numerous types of assays can be undertaken with these slides, such as endothelial cell growth under flow, rolling and adhesion assays, calcium imaging or 3D cell culture. These slides offer a large area of uniform shear stress, and a homogeneous cell distribution. Thanks to their female Luer connectors, the slides can be really easily connected to a perfusion system. The ibidi μ-Slides VI consist of 6 parallel channels. 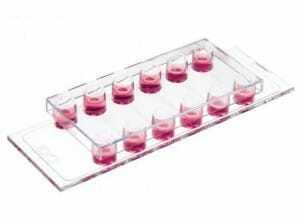 The design of these slides allows to perform parallel assays such as drug screening with up to six different experimental conditions. This ibidi μ-slide presents bifurcations which are perfect for blood vessels simulation. The bifurcation angle measures 30° in in one direction and 45° in the other direction, allowing to test two different experimental conditions one slide. For all the μ-slides, ibidi offers several surface treatments. This is a major benefit of these flow slides, considering that the growth, development and signalling of the cells are strongly dependent on the surface the cells are cultivated on. All these surfaces have been treated with a large variety of standard cell lines. Tissue culture treated surface – ibiTreat. This is a physical surface treatment which improves cell adhesion. The surface is comparable to the surface of standard cell culture flasks and Petri dishes. Collagen IV. This is the type of collagen found primarily in large extracellular basement membrane structures and complex organs. Poly-L-Lysine (PLL) / Poly-D-Lysine (PDL). PLL and PDL are polymers of the amino acids L-Lysine and D-Lysine respectively. Poly-Lysine is one of the most commonly used adhesion substrates. It is suitable for use with a large variety of cell types, especially for neuronal cultures. Fibronectin. It is a glycoprotein that is widely used in cell culture coatings. It plays an important role in cell surface interactions, which are mediated by an RGD motive. Fibronectin allows neurite outgrowth, and has been used for glial and neural cells. Hydrophobic, uncoated. This type of surface is not suited for cell adhesion, but can be used for specific coating procedures or for non adherent cells.